Confirmation now from David Legrand at Fraser Yachts that his central listing, the newly delivered 36.4m expedition yacht Nomade is now sold, with independent broker Derk Jan Rolff introducing the buyer. The timing is impeccable, as she is featured in the current issue of Boat International, including a stunning picture of her on the front cover. She was built by Turkey’s Tansu Yachts and is RINA class with full MCA compliancy. Accommodation is for 10 guests and twin 1300hp Caterpillar engines give her a range of 3,000 nautical miles. Her new owner, the founder of a successful fashion brand, was looking for a support vessel for Firefly, the 35.2m fast sailing yacht which he took delivery of earlier in the Summer. He chose Nomade because her contemporary design contrasted nicely with the classic lines of Firefly, and because she has "lots of deck space to host our sailing crew." Appropriately, she's being renamed Bartender. He is planning to make some changes to the interior so that the details and colors of the two yachts match. 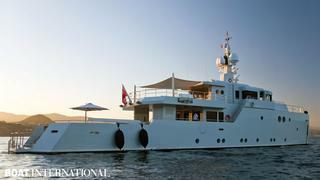 She is currently on display at the Monaco Yacht Show. Nomade's final asking price was €9.1 million.